Stay connected from anywhere. Power to do it all. All at once. iPad Air brings more of our most powerful technologies to more people than ever. A12 Bionic chip with Neural Engine. A 10.5-inch Retina display with True Tone. Support for Apple Pencil and the Smart Keyboard. And at just 456 grams and 6.1 millimetres thin, carrying all that power is effortless. 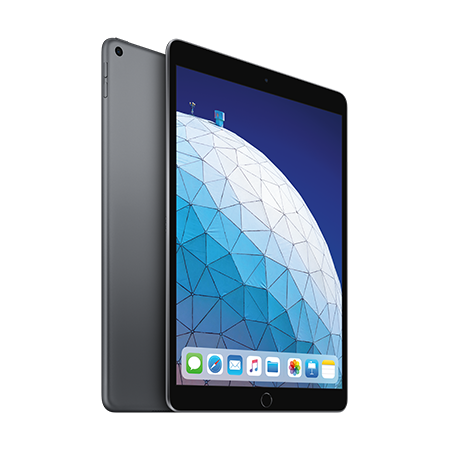 iPad Air features a large 10.5‑inch Retina display, while remaining extremely portable and perfect for getting things done anywhere. It’s thin and light and features advanced wireless connectivity. And with up to 10 hours of battery life, iPad Air can go all day on a single charge.